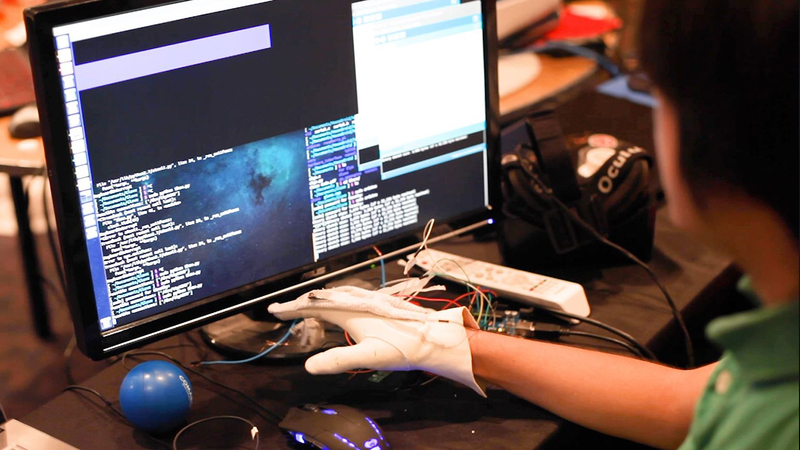 A student is seen developing a prototype at a Major League Hacking event. More than 200 students from around the country will convene at Auburn University this weekend to take part in AuburnHacks, the university’s first student-led technology competition. Known as an “invention marathon,” a hackathon is a weekend-long competition where students attempt to solve a challenge by building and sharing their technological creations. Auburn is partnering with Major League Hacking for the first time to bring out the best and brightest students, not just from Auburn University but from other universities all over the United States. Jeriel Ng, a senior in computer science and co-organizer of AuburnHacks, first became interested in hackathons after attending MinneHack in Minneapolis with a few friends, including co-organizers Taric Jain and Sai Dasika. After experiencing the atmosphere and fast-paced competition, they were hooked. “We went to a few other hackathons that month, and we decided there is a need for this at Auburn University,” Ng said. By partnering with Major League Hacking, the students were provided with a roadmap to start a hackathon as well as a host of resources to support the competition. More than 65,000 students in 16 countries have participated in Major League Hacking hackathons since its inception in 2013. AuburnHacks participants will receive a challenge at the start of the event and then have 24 hours to build a technological solution. The Auburn University Student Center will host the competition, which starts at noon Saturday and runs through 4 p.m. Sunday. “The main purpose of starting AuburnHacks was to really push the use of practical applications of whatever you learn in the classroom,” said Jain, a senior in computer science. The event will also serve as a valuable showcase for students to potential employers. Twelve companies have sponsored the competition and will have representatives on hand to mentor the students and recruit them for internships and jobs. Follow AuburnHacks at facebook.com/AuburnHacks, twitter.com/AuburnHacks and instagram.com/AuburnHacks.